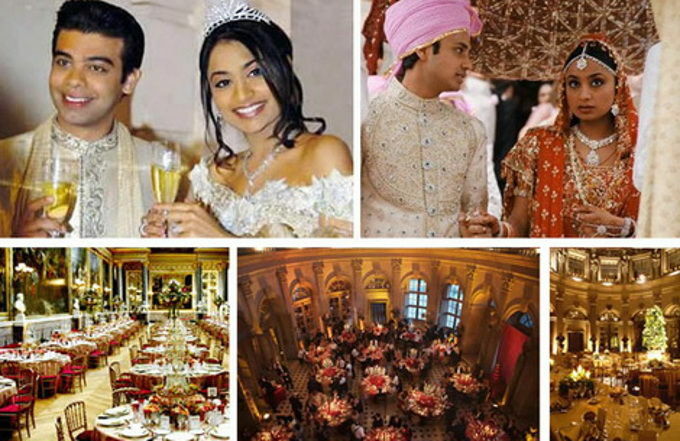 13 Most Royal Indian Celebrity Weddings – No.1 Cost Over 500 Crores. 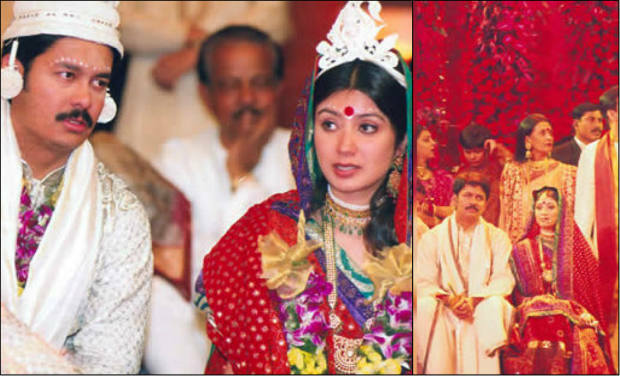 Since this happened way back in time and value of money was quite different then, we can definitely say it was one of the most expensive Indian celeb wedding till date. The couple knew each other for 6 years before they tied the knot. Cost of wedding: Rs. 1 crore. 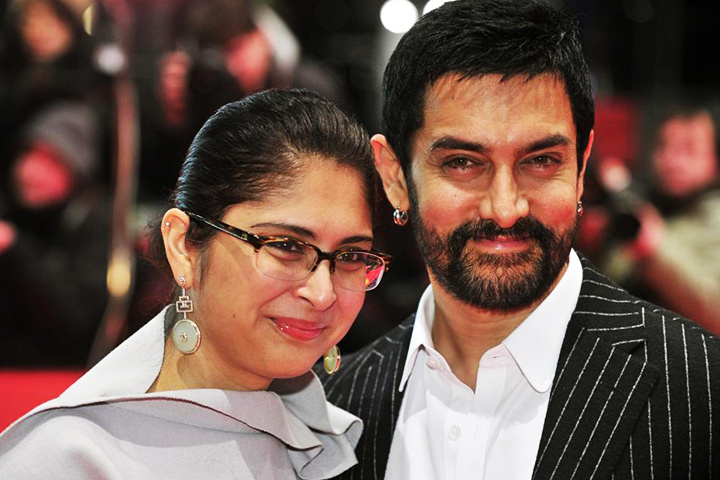 During the making of Lagaan, Amir proposed to his love Kiran Rao who was also the assistant director of the movie. The couple have been fond of each other’s non filmi persona. Cost of wedding: Rs. 2 crore. Cost of wedding: Rs. 3 crore. 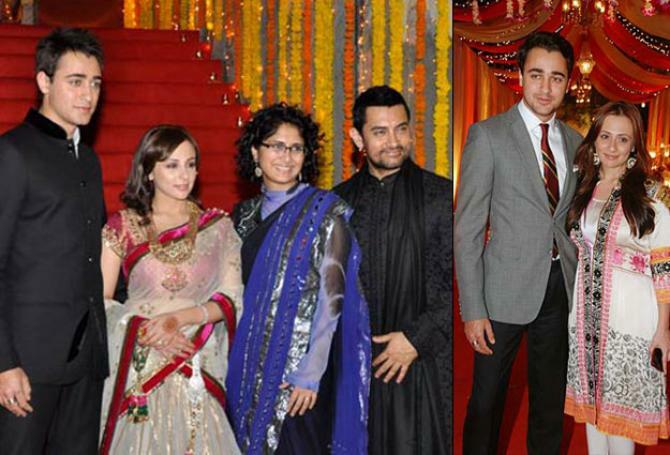 When the Bollywood bad boy decided to tie the knot, he made sure that it was grand as well. He proposed marriage to Twinkle Khanna and wedded her in 2001. Cost of wedding: Rs. 3.5 crore. How can we forget one of our most gorgeous desi beauties when it comes to marriage. Shilpa Shetty gave into the concept when NRI Raj Kundra entered her life. They got married and it has been happily ever after! Cost of wedding: Rs. 4 crore. Even though Salman never got married to anyone, he made sure that his sister got all the Bollywood charm in it. The most recent wedding of Arpita at the Taj Falaknuma was beyond grand. Cost of wedding: Rs. 5 crore. The chocolate boy Imran and his love Avantika may seem very simple when it comes to their general approach to life but his wedding was not. The couple was blessed by the entire Bollywood legion. Cost of wedding: Rs. 5.2 crore. The ten-year-long relationship that these cherished lovebirds had slowly moved into the marriage phase. Both Hindu and Christian wedding ceremonies were performed and both of them looked perfect on all occasions. Cost of wedding: Rs. 5.5 crore. 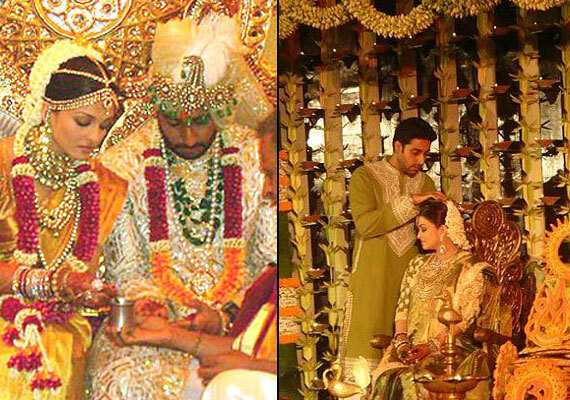 One of the most anticipated weddings in the Bollywood family was when Aishwarya and Abhishek tied the knot. It’s said that the couple fell in love on the sets of Guru even though they knew each other for a long time. Cost of wedding: Rs. 6 crore. 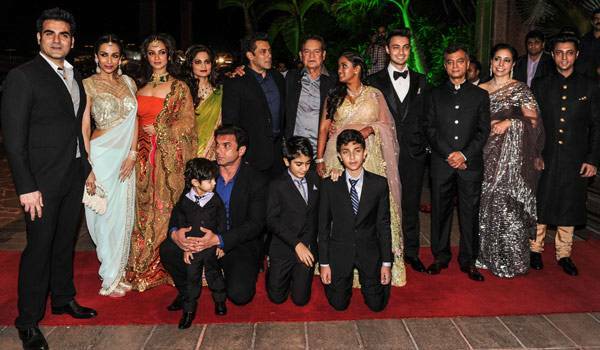 If it’s about expensive weddings, then how can we leave the Pataudi wedding. 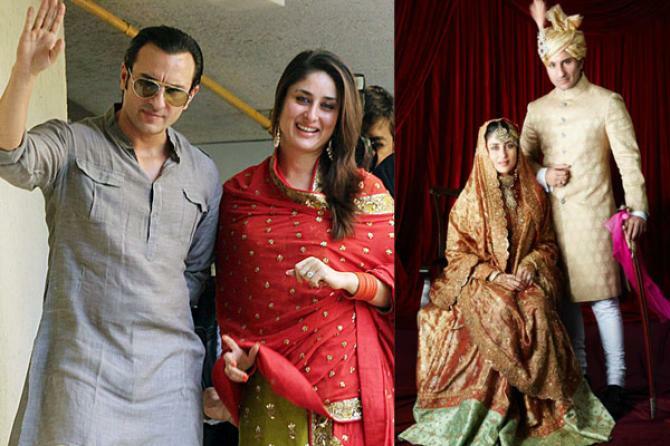 Kareena finally gave in to her long time love Saif Ali Khan and they got married in a grand Maharaja style. Cost of wedding: Rs. 10 crore. The entire Hitex exhibition ground underwent a huge change for the wedding of Jr. N.T.R and Lakshmi Pranitha. The Kalyan Mandapam was set by the Art director Anand Sai. Truly bringing cinema live! Cost of wedding: Rs. 18 crore. We know that celebs down south are no less, especially when we know the kind of gifts and gold that is presented at these weddings. But it was a little difficult tracking them to their exact measures. We know the engagement of Allu Arjun or of Ram Charan was at least Rs. 4 crores, which goes to say that the wedding would cost way more. 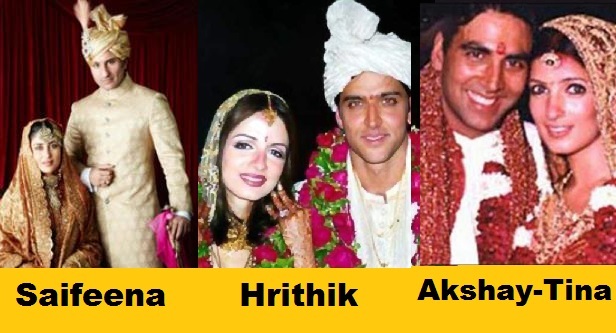 Before we close the chapter on expensive Indian weddings, we suggest you take a look at the richest ones till date. After all being a business tycoon means you present a grand front every time. We really cannot emphasize on the finer details but the cost should say it all. Cost of wedding: Rs. 350 crores. One of the grandest Indian weddings ever also cost the Billionaire Laxmi Mittal a big fortune. 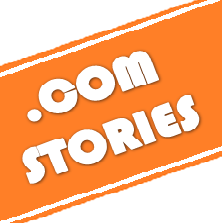 When his daughter Vanisha’s Mittal got married to Amit Bhatia, a banker the whole world talked about the wedding. This destination wedding took place in the Palace of Versailles, Hotel Cabaret and Hotel Bristol, Vaux Le Vicomte, Georges Cinq, Jardin-des-Tuileres and cost the Steel Magnate over 3 Billion INR. In 2004, founder and Chairman of the Sahara India, Subrata Roy spent a whopping 552 crores(INR) on his sons Seemanto and Sushanto’s wedding. Both of his sons got married in the Sahara Village in Lucknow, on the same day. The star-studded guests filled their belly with food comprising 101 unique cuisines from all over the world while the famous choreographer Shiamak Davar’s dance troupe entertained them. Cost of wedding: Rs. 552 crores. It seemed like a big showoff till the news came that around one lakh and forty thousand beggars were distributed food across the country on this grand Sahara occasion. A perfect wedding after all. Is it safe to say you may be experiencing dizziness now! ?